If you battle on a daily basis with curls you want to wave goodbye to, then the new Got2b Play it Straight kit from Schwarzkopf may be just the thing for you. Banish out-of-control curls and flyaway frizz by following the two simple Smoothing & Sealing steps to create perfectly sleek, straight styles that will last up to 10 washes. Think of it as a professional blow-dry at home – every day! It's an at-home treatment that can give you gorgeously glossy straight hair for up to 10 days! Containing a special protein to help loosen the bonds that make hair frizzy, the two step programme promises to calm frizz, make for easier blowdrying and give you more manageable hair. And you don't have to worry about it drying hair out, containing wheat, silk and keratin proteins means it conditions as it straightens. I am definitely going to try this out, I have a natural wave in my hair and if wanting to wear straight either blowdry straight myself or whip out the straighteners. I think this would cut down my styling time and help avoid overuse of heat tools. 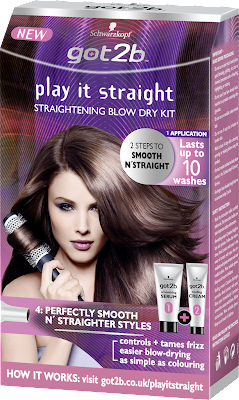 Schwarzkopf got2b play it straight kit is priced at £6.99, and is available from Boots, Superdrug, Asda, Savers and Amazon. You can also find lots more information about the kit, and all the other products in the got2b range on their Facebook page. Have you tried the blow dry kit? 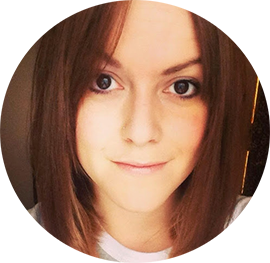 Is it something you think you'd find useful in the battle to tame your hair?